Hopes and dreams don’t just hang in our minds, sometimes they hang in picture frames. 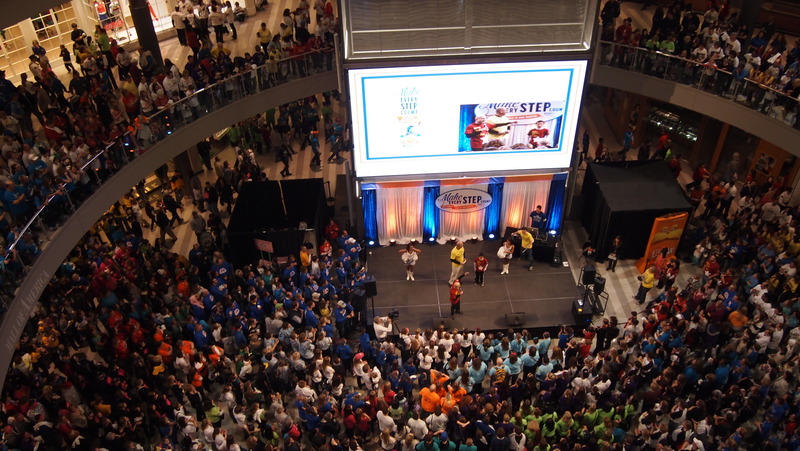 At the recent Minnesota JDRF Walk to Cure Diabetes, the hopes and dreams spilled from the pictures taken and pictures displayed on shirts and posters all across the Mall of America. Almost all of them were of children. Each one shouts a story, each one begs for someone to listen. But the one picture that doesn’t exist is the image reserved for the empty frame that sits in each of our homes. That’s the frame waiting for a picture of a cure. Until then, I still fill my frames with hopes and dreams for my daughters Maddy and Emme. Maddy was diagnosed with Type-1 diabetes at the age of three, Emme at the age of eleven. It’s not an easy disease for children, or their parents. Manageable, yes. Easy, no. Besides the constant blood sugar tests, carb counting and needles sticks, there is the worry and many times the feeling of isolation and exasperation. At this year’s Walk there were two girls who know both the isolation and exasperation. Alyssa Kapaun is a fifth grader who every day eats lunch by herself because she returns late to the cafeteria after getting her insulin shot in the nurse’s office. To a parent, it’s a crushing sight; Alyssa on one end of the cafeteria all alone, her class on the other end. I recently had the chance to meet Alyssa at her school—she didn’t eat lunch alone that day. 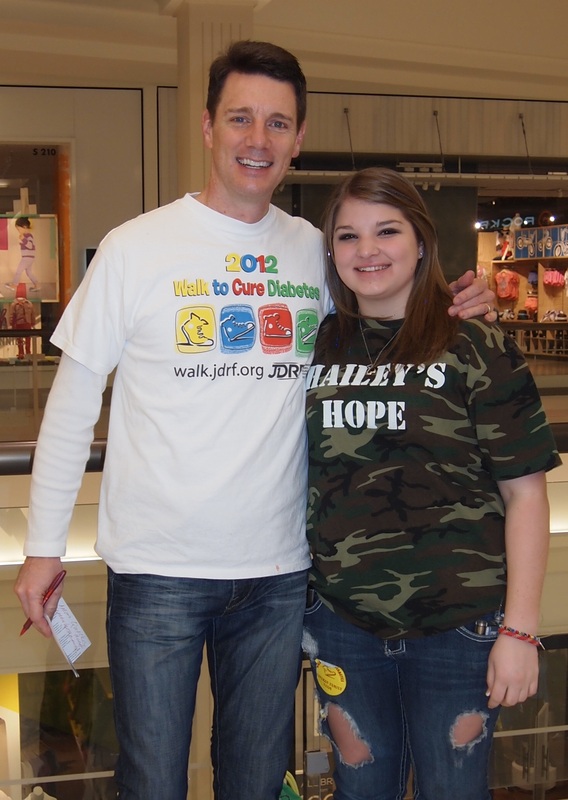 And then there’s Hailey Stark, a high school freshman I first met at last year’s Walk hobbling along on crutches. She was having a hard time of it. The struggles of being a teenager, in addition to one with diabetes AND a broken leg were written on her face as plain as a low blood sugar reading. She didn’t give up then, and she hasn’t given up now. What a thrill it was to see her again at this year’s Walk without the crutches and with a team of friends. The message that I hope Alyssa and Hailey took home from the 21,000 people at this year’s walk is that you’re never alone. 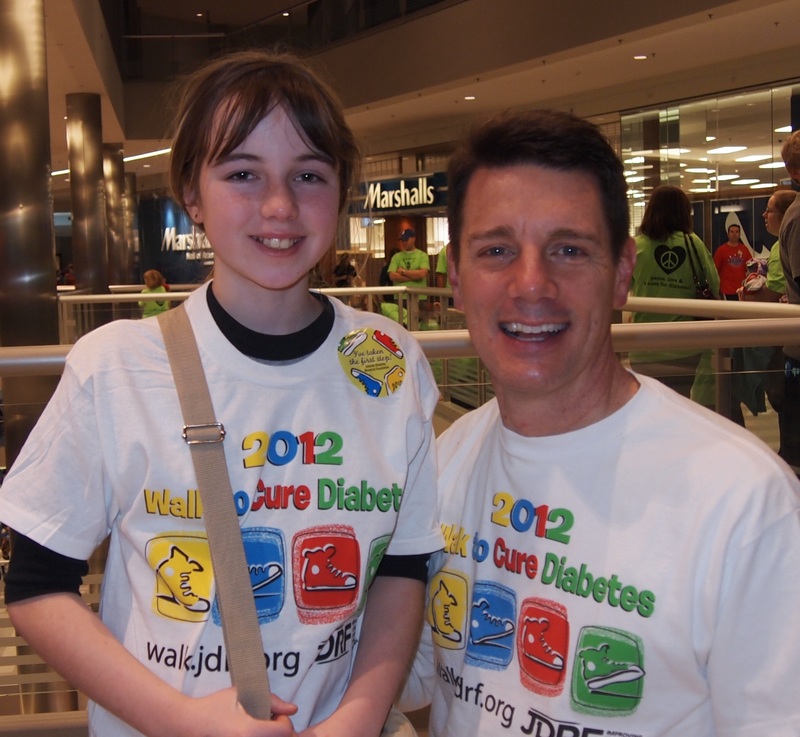 The stories of those two children drive what is both an essential function and brand for JDRF. At its core JDRF is a charitable organization that drives and funds essential research to cure, treat, and prevent Type-1 diabetes. Since a group of mothers founded JDRF in 1970, it has contributed $1.6 billion toward research to find a cure–$116 million in 2011 alone. In many ways, it is invisible work conducted in laboratories and clinics around the world. But as Alyssa and Hailey show us, it is JDRF’s visible work of programming the Walks and fundraisers that provide a core social purpose and create a powerful brand. Two years ago I conducted a communications research study to identify leverageable consumer insights into the Walk to Cure Diabetes. Part of the study’s methodology utilized a Zaltman-style elicitation analysis that had a number of people affected by Type-1 diabetes assemble a series of pictures that best describe their feelings and thoughts about the disease. 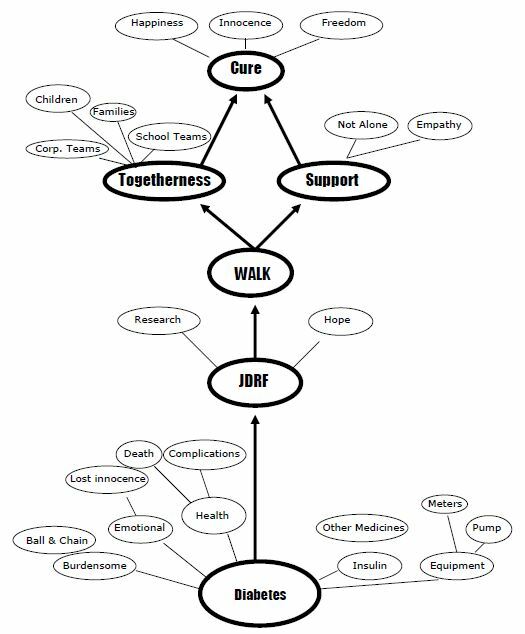 The elicitation study produced a mental model map that started with diabetes and its burdens and laddered up to JDRF, the Walk, and finally, a cure. (Figure 1) The subjects in the study produced two important and equal mind models of the Walk, one of support, and one of togetherness. In the togetherness model, the concepts of “empathy” and the thought of “not being alone” stood out among the participants. To all of the study’s subjects, the Walk represented the possibilities of a cure and the higher level values of happiness, innocence, and freedom. Together, this mental map produced a number of important take-aways. What became very clear from the research is that people with ties to JDRF viewed it as a community. Not just any community—A Cure Community. JDRF has done extensive work in the past year to rebrand itself as the Type-1 diabetes organization. It’s certainly one way to differentiate itself from the American Diabetes Association (ADA) which also supports research but has a core mission of helping people with diabetes live better lives. The people who continue to support JDRF with their dollars want something more. They want a cure and a return to the freedom and happiness it represents. That’s why the consumer insight into JDRF as a cure community is so powerful. It is the foundation to a brand for JDRF that has real meaning. 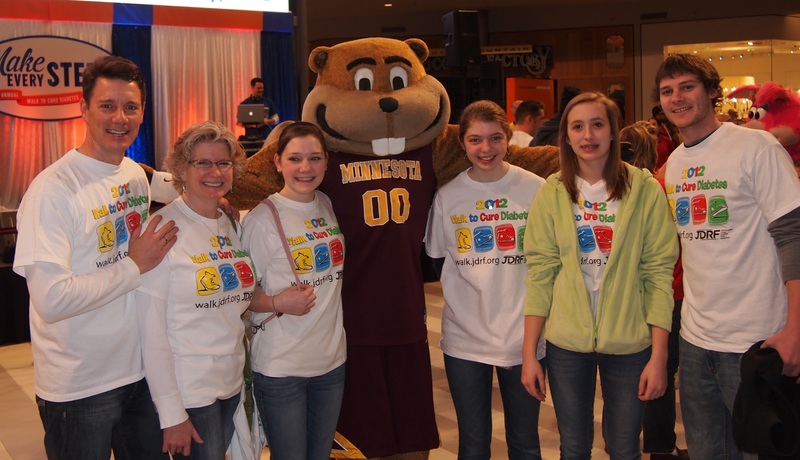 The 21,000 people who raised $2.1 million at the recent JDRF Walk know it. Now Alyssa Kapaun and Hailey Stark know it, too. They exist in their parents’ picture frames just as Maddy and Emme exist in my own. And then there’s that empty frame, too. I’m holding out to fill it with one giant group-shot of all the people we cure.